PURSUED. 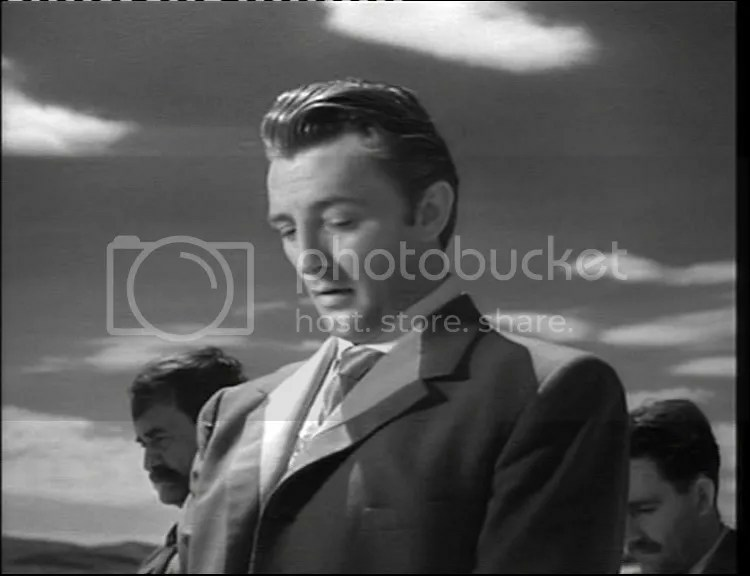 Robert Mitchum as Jeb Rand attends the funeral of the man he killed, Harry Carey. Stunning photog by James Wong Howe. I guess he’s using a polarising filter to make the sky ultra dark. Either there’s a really strong low sun or he’s actually lighting it — it has a sort of artificial look, but I guess it’s sunlight alright — the sky is basically clear. So they’re filming it late in the day as the sun sinks, and the brightness plus the unnaturally dark sky give it a dreamlike, unnatural quality. And anything with Dame Judith Anderson (Mrs. Danvers in REBECCA, and by the way, where do you suppose MISTER Danvers is?) gets extra dream-points. The idea of a Dame out west is appealing too. Theresa Wright, who’s always admirable, but usually very sweet and innocent, gets to be really strong and interesting in this movie. 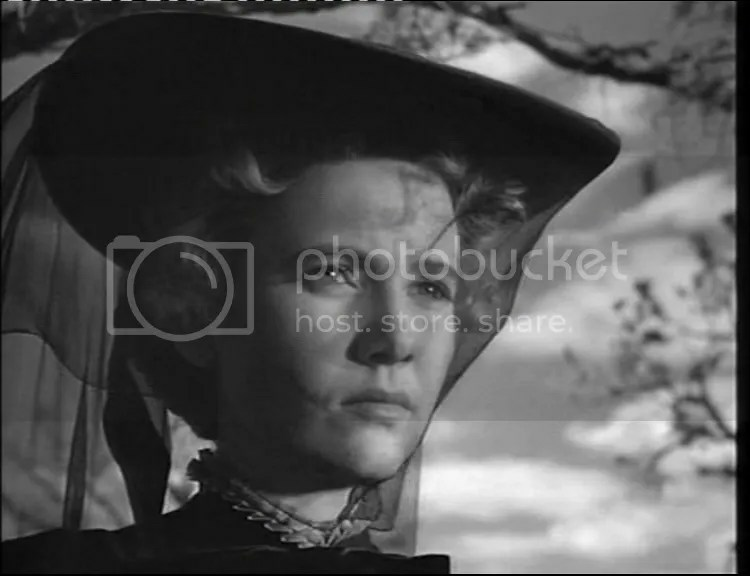 She look at Mitchum and silently vows to marry him — then kill him! Screenwriter Niven Busch scripted THE POSTMAN ALWAYS RINGS TWICE and is generally more associated with the noir scene than with westerns. The dialogue is nice too, with pleasing archaisms like “I disremember,” and “must be boresome.” You can’t have too much of that kind of lingo in my book. Well, you CAN, but usually the problem is you don’t have enough. 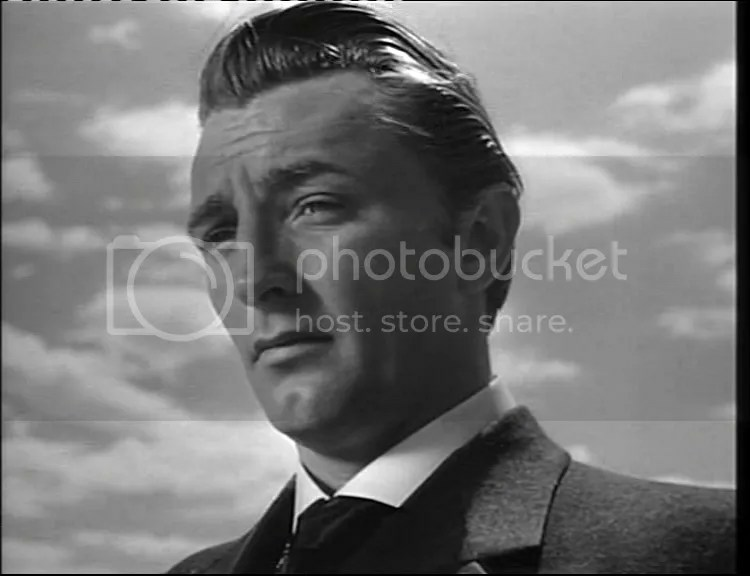 “Generally better to overdo these things,” as Mitchum himself says in the remake of CAPE FEAR. 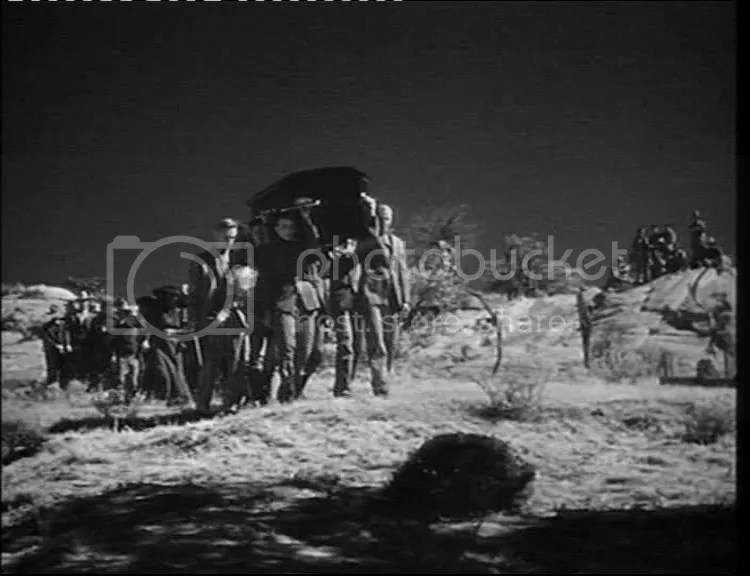 I guess if this was a John Ford film we might have a long shot with a low horizon and plenty of sky, which would have been pictorially very nice but not helpful really. 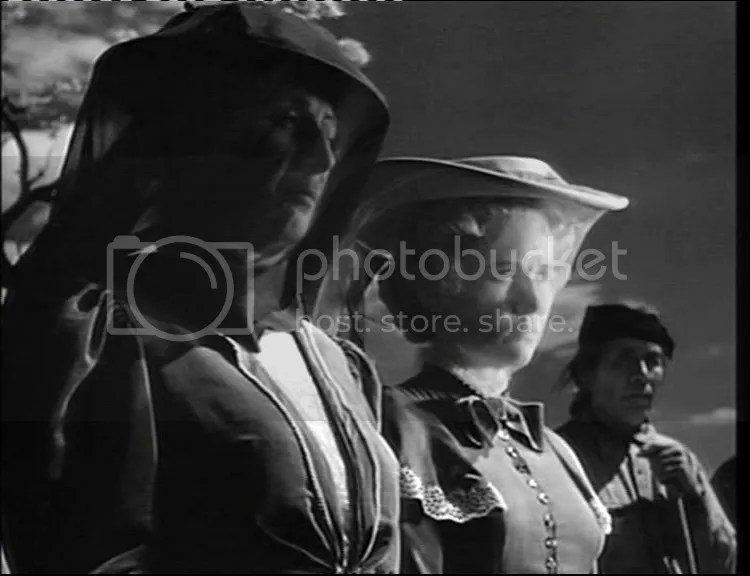 This is definitely a film noir pretending to be a western, and noir is a fair distance from the Ford style. 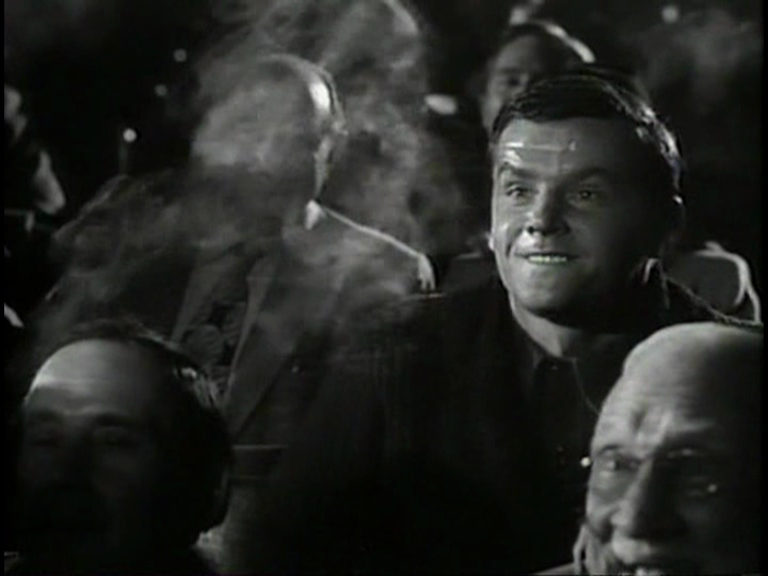 Although the Ford style takes in Murnau-isms at times, so is closer to noir than I’m acknowledging. Aw, I’m just hedging my bets all over the place. Time I went to bed.